It was our turn in the pro-am. Heat index over 100. Love those golf carts. I arrived at the course about an hour and a half early. When Maddie showed I took the clubs to the putting green and only then I noticed my shirt was inside out. No one else noticed for all that time. Even though I had a last year’s yardage book I had to buy a new one. The previous book was pathetic. Didn’t have any sprinklers just distances from colored dots which were painted on the fairways. Kenny “The Wizard” did the one for this year and it’s much better. Very professional. Maddie has given me a shout-out in her blog (madeleinesheils.com) along with some very kind words so I will reciprocate. Here goes. All that aside, she’s pretty neat and has a good sense of humor. I hope. Decatur was the original home of the Chicago Bears and the first professional football game was played here. 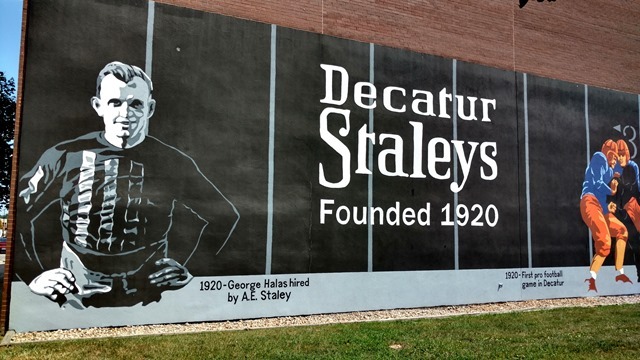 Originally known as the Decatur Staleys, they moved up north in 1921. This entry was posted on Thursday, August 11th, 2016 at 7:17 pm and is filed under Uncategorized. You can follow any responses to this entry through the RSS 2.0 feed. You can leave a response, or trackback from your own site. Hi Larry, Madeleine did say some very nice things about you in her blog. I think you may have gone a bit too far with your adjectives of Madeleine. That was a scene from Ground Hog Day, Duh!